The jacket is red silk and has ALL hand sewn red glass beads all over it. It took almost 30 days of constant sewing to bead this Michael Jackson costume jacket. There are gold mortar boards on the shoulder with gold metal buttons, with gold metal buttons down the front of the jacket. Also, there is hand designed gold saw tooth braid made into frogs across the chest. So, the trousers are made of black polyester. 2 pockets in the front and 2 in the back with black satin stripe down the sides of the trousers. Also, there is a sash that crosses the jacket out of gold and blue hand sewn sequins. On my son’s right hand is a white glove that is fully beaded with glass crystal beads. 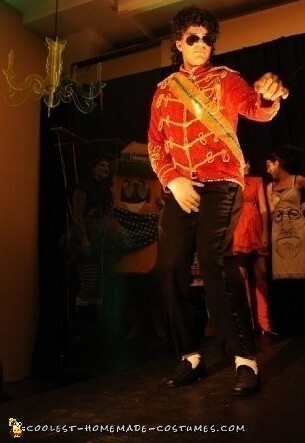 Also, the costume depicts Michael Jackson in his American Academy Awards jacket and ensemble. People flocked around him and couldn’t believe the costume. It took me 5 months to finish the costume. And the design is done with no commercial patterns. There were times I just wanted to give up, but continued on. There were times that I had to wear sunglasses as the stones were mesmerizing in the light and under a lamp. It took 10 days to sew all the beads on the glove. I swore and cried and said I would never ever do a costume like this one again. We entered this costume online and he went to several places where they we sponsoring halloween costume contests. He came in 2nd place at Ignit Models, INC. in Minneapolis, Minnesota. He won 1st place at the local bar in town and won over $300.00 in cash and prizes online. So, this was the first time I had ever made a costume of this epic proportion and I had nightmares of being chased by a rolling pincushion full of pins! 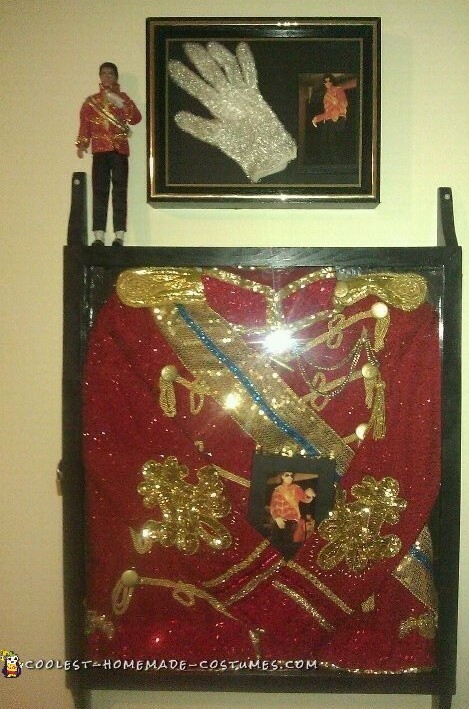 After all was said and done, for my son’s birthday, I placed his precious costume in a shadow box and he now has it hanging on the wall in the living room of his house along with the beaded glove! My son was a Michael Jackson big time fan and still is!